The Outlook Web Access Web Parts enable you to display selected content from folders in your Microsoft Exchange Server 2003 to 2007 email account in a SharePoint site. This article explains how to use these Web Parts to customize your My Site. Important: These Web Parts are connected to your organization’s Office Outlook Web Access server, not directly to Microsoft Exchange Server. To set up the Outlook Web Access Web Parts, you will need to get the URL for the Outlook Web Access server from your organization's IT department. From a page, in the ribbon, click the Page tab, and then click the Edit Page command. Note: If the Edit Page command is disabled, you may not have the permissions to edit the page. Contact your administrator. Click on the page where you want to add a Web Part, click the Insert tab, and then click Web Part. Under Categories, click Outlook Web App. Under Web Parts, select the Outlook Web Access Web Part that you want to add to the page, and then click Add. On the page, point to the Web Part, click the down arrow, and then click Edit Web Part. 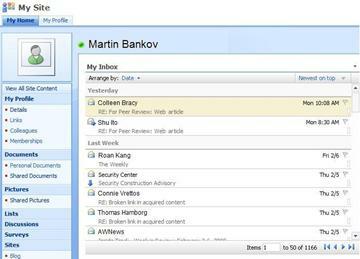 In Mailbox, type your email address, such as connie@contoso.com. Configure the other options for the Web Part as you prefer. Click OK to save your settings and exit the tool pane, or click Apply to see your changes without closing the tool pane.. When you have finished editing the page, click the Page tab, and then click Stop Editing. Note: For all of the Web Parts except the My Contacts Web Part, you can change the view while you are using the Web Part. If you choose Two Line view for the My Contacts Web Part, you cannot change it while you are using the Web Part. You will be prompted to log into Outlook Web Access. To read the contents of a message, click the message subject. You will be prompted to log into Outlook Web Access. To send a message, click the Web Part title. You will be prompted to log into Outlook Web Access. To add or edit a contact, click the Web Part title. You will be prompted to log into Outlook Web Access. To view or edit an appointment, double-click the appointment. You will be prompted to log into Outlook Web Access. After you log in, the appointment dialog box opens. To add an appointment, double-click the date and time for the appointment. You will be prompted to log into Outlook Web Access. After you log in, the appointment dialog box opens. You can use the New button on the calendar toolbar to create a new appointment, meeting request, email message, or contact. Click the down-arrow next to the New button and click the item you want to create. You will be prompted to log into Outlook Web Access. After you log in, the appropriate dialog box opens. If you want see your full Outlook account (all folders) in your SharePoint site, you can use the Page Viewer Web Part to display the Outlook Web Access page. Under Categories, click Media and Content. Under Web Parts, select the Page Viewer Web Part, and then click Add. On the page, point to the Page Viewer Web Part, click the down arrow, and then click Edit Web Part. You may want to adjust the height of the Web Part in the tool pane until it shows as much of the Outlook Web Access interface as you want. To do this, click Appearance under Should the Web Part have a fixed height?, click Yes, and then type the number of pixels, such as 500. Click OK to save your settings and exit the tool pane, or click Apply to see your changes without closing the tool pane. When you have finished editing the page, click the Page tab, and then click Save & Close. Outlook Web App Web Parts do not yet work properly when used against Exchange Online in Office 365 beta. However, you can instead use the Page Viewer Web Part to display your Outlook Web App information within SharePoint Online. Under All Categories, click Media and Content. Click the Page Viewer Web Part, and then click Add. Under Page Viewer on the tool pane, make sure Web Page is selected. In the Link field, type the URL for the Outlook Web App. Note that the Outlook URL must include the parameter exsvurl=1. For example, the Outlook URL typically resembles the following: https://www.outlook.com/owa/?exsvurl=1&cmd=contents&part=1&fpath=inbox&realm=contoso.onmicrosoft.com , where the SharePoint Online realm “contoso.onmicrosoft.com” represents the URL you used when you signed up for your Office 365 subscription. For more details on defining the Outlook URL to enter in the Link field, see “Using Outlook Web App Web Parts” below. For additional tips on defining an Outlook URL, such as parameters you can add to show specific pages or views, see Using Outlook Web App Web Parts on Microsoft TechNet.